Cut the pinions (tips) off the wings and cut each wing through the joint to create winglets. 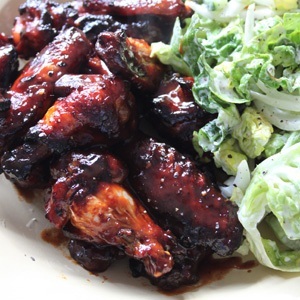 Combine the marinade ingredients in a medium bowl and add the wings. Allow to marinate for as long as possible (at least 30 minutes). Remove the wings from the marinade and place onto the baking tray (reserve the marinade). Roast for 20–25 minutes, shaking the tray halfway through cooking. Meanwhile, place the reserved marinade into a small pot, bring to the boil and gently simmer for 10 minutes. When ready to serve, toss all the salad ingredients, including the oil and dressing, together.